A regular breeding resident and migrant throughout the state and a regular winter visitor. The Cedar Waxwing was a common species during the Minnesota Breeding Bird Atlas (MNBBA). Distributed across southern Canada and the northern half of the United States, the Cedar Waxwing reaches its highest breeding densities in the northeastern United States and in southeastern Canada, occurring from the Great Lakes region to the Maritime Provinces and in scattered small pockets in the Pacific Northwest (Figure 1). Considered a short-distance migrant, but winter movements are quite irregular, responding largely to availability of berries and fruits. Fleshy fruits and insects taken by foliage gleaning and fly-catching. Open-cup nest placed in a deciduous or coniferous tree or shrub generally 2 to 15 m high. Breeding distribution and relative abundance of the Cedar Waxwing in North America based on the federal Breeding Bird Survey, 2011–2015 (Sauer et al. 2017). In the early 1900s, Roberts (1932) considered the Cedar Waxwing a common summer resident throughout the state, noting it was “most abundant in the northern coniferous forests, where it is at home both on the uplands and in the spruce and tamarack swamps.” Confirmed nesting records (nests with eggs or young) were available from 13 counties across the state, ranging from Jackson and Goodhue Counties in southern Minnesota; to Anoka, Hennepin, and Sherburne Counties in east-central Minnesota; and north to numerous counties that span the Tallgrass Aspen Parklands Province and northern forest regions. Given that the species is often characterized as a late-nesting species that times the hatching of its young with the availability of summer berries, Roberts made a special effort to note two particularly early nesting efforts: a June 10, 1888, record in Minneapolis and a June 8, 1919, record in Crookston in far northwestern Minnesota. Forty years later, Green and Janssen (1975) described the Cedar Waxwing as a resident in the forested regions of the state, but they were uncertain about its status in the western grasslands and agricultural counties. Although flocks of birds were observed in the region during the summer months, only two breeding records were confirmed south of the Minnesota River: Roberts’s reported 1898 record from Jackson County and a more recent 1948 record from Lac qui Parle County. Yet only a few years later, Janssen (1987) would describe the species as not only numerous in the forests and open woodlands of eastern, central, and northwestern Minnesota but most numerous in the northwestern, east-central, and southwestern regions of the state. It remained quite rare, he commented, in west-central and southeastern Minnesota. Janssen also delineated 31 counties where nesting had been confirmed since 1970, most of which were located in northern and east-central Minnesota. By 1998, Hertzel and Janssen would add an additional 13 counties to the list. As of 2014, Minnesota Biological Survey field biologists documented a total of 928 Cedar Waxwing breeding season locations. The majority of records were in northern counties, but the species was well distributed in counties south of the Minnesota River (Minnesota Department of Natural Resources 2016). Over the five-year period covering the MNBBA, participants reported 3,277 Cedar Waxwing detections from 44.7% (2,127/4,761) of the surveyed atlas blocks and from 57.6% (1,345/2,337) of the priority blocks. Breeding was confirmed in 249 blocks (Figures 2 and 3; Table 1). The birds were reported in all 87 Minnesota counties and were confirmed breeding in 67 counties; 3 counties were added because of blocks that straddled 2 counties (Lac qui Parle, Morrison, and Stearns). Of the 20 counties where nesting was not confirmed, 11 were located in southern Minnesota, south of a line between the Twin Cities and Lac qui Parle County; most of those counties were in the southwestern corner of the state. Clearly, in the nearly one hundred years since Roberts (1932) first wrote his account of the species’ status, the Cedar Waxwing has become well established in towns and cities across the state. Although the species remains abundant in the northern forest, it is well distributed in the open woodlands that characterize the transitional forest belt that stretches from the southeast corner of the state through west-central and northwestern Minnesota. The species remains least common in the intensively cultivated Red River valley and, contrary to Janssen (1987), in the southwestern corner of the state. In the upper Midwest, the Cedar Waxwing’s breeding distribution has shown no widespread changes. Historically, it was and remains a widely distributed species. Elsewhere within its breeding range, two distributional changes have been noted: (1) in the past 30 years, the Cedar Waxwing has become more common in the northeastern United States and southeastern Canada, and (2) the southern periphery of the species’ breeding range has expanded south in regions of Kentucky, southern Ohio, Maryland, and Virginia (Witmer et al. 2014). Breeding distribution of the Cedar Waxwing in Minnesota based on the Breeding Bird Atlas (2009 – 2013). Summary statistics of observations by breeding status category for the Cedar Waxwing in Minnesota based on all blocks (each 5 km x 5 km) surveyed during the Breeding Bird Atlas (2009-2013). Summary statistics for the Cedar Waxwing observations by breeding status category for all blocks and priority blocks (each 5 km x 5 km) surveyed during the Minnesota Breeding Bird Atlas (2009-2013). The availability of fruits and berries may be the best predictor of suitable habitats for the Cedar Waxwing, which is a habitat generalist. As long as sufficient food resources are available, the species can be found using a wide variety of upland and lowland woodlands, including deciduous, coniferous, and mixed forests. If scattered trees and shrubs are present, even old fields and grasslands may be used. Only the interior of forest stands are avoided, as the birds prefer open woodlands and edge habitats that provide more sunlight for fruiting plants (Witmer et al. 2014; Kaufman 1996; Ehrlich et al. 1988). Although fruits and berries are the mainstay of the Cedar Waxwing’s diet, insects are important during the summer months. Adept at fly-catching and hawking insects on the wing, the species often favors open riparian habitats that provide access to an abundant supply of emerging aquatic insects (Figure 4). Human-modified landscapes that incorporate ornamental plantings of fruiting trees and shrubs also provide suitable habitats, including residential areas, cemeteries, orchards, parks, and golf courses. Fidelity to any given breeding area, however, is quite low. The Cedar Waxwing’s nomadic tendencies enable it to respond quickly to the unpredictability of available food resources (Witmer et al. 2014). The National Forest Bird (NFB) Monitoring Program in northern Wisconsin and Minnesota demonstrated that in densely forested landscapes, the Cedar Waxwing was most closely associated with small towns, followed by open wetlands (Niemi et al. 2016). Habitat data collected within 200 m of MNBBA point counts where the Cedar Waxwing was detected also demonstrated the wide range of habitats utilized by the species. It was most closely associated with development, followed by pine forests and pine-oak barrens (Figure 5). Typical breeding habitat of the Cedar Waxwing in Minnesota (© Lee A. Pfannmuller). Habitat profile for the Cedar Waxwing based on habitats within 200 m of point counts where the species was present during the Minnesota Breeding Bird Atlas (2009-2013). Models using data collected by the federal Breeding Bird Survey (BBS) have generated a North American population estimate of 57 million birds (Rosenberg et al. 2016). In 2013, Minnesota was estimated to support approximately 2.3% of the continental population (Partners in Flight Science Committee 2013). When that percentage is applied to the most recent population estimate, it yields a statewide estimate of 1.3 million breeding adults. Because of the species’ non-territorial habits, a statewide estimate using MNBBA data was not generated. Despite the Cedar Waxwing’s abundance in Minnesota, higher breeding densities are found in states further to the south and east (Figure 1). In Minnesota, BBS volunteers report an average of 5 birds per route each year. This compares to an annual average of 22–26 birds per route in Maine, Vermont, and New Hampshire and 24 birds per route in Michigan (Sauer et al. 2017). Non-territorial throughout the year, the Cedar Waxwing often nests in small, loose colonies of several pairs. Breeding densities can be difficult to assess, given the bird’s nomadic habits and overlapping home ranges (Witmer et al. 2014). Among states reporting the highest numbers of birds along BBS routes, nesting densities have ranged from 4.9 nests per ha in Connecticut (Saunders 1911) to 14.1 nests per ha in Michigan (Rothstein 1971). In northern Minnesota, where the Cedar Waxwing is plentiful, the NFB Monitoring Program on the Chippewa and Superior National Forests provides more details on the species’ relative abundance. From 1995 to 2010, an average of 3.8 pairs per 40 ha was reported on the Chippewa National Forest and 3.7 pairs per 40 ha on the Superior National Forest. The species reached its highest breeding densities in young, regenerating conifer stands: 9.2 pairs per 40 ha on the Chippewa and 7.9 pairs per 40 ha on the Superior (Niemi et al. 2016). Overall, since long-term monitoring began in 1966, the Cedar Waxwing’s population has remained quite stable. Survey-wide, numbers have demonstrated a nonsignificant increase of 0.07% per year (Sauer et al. 2017). In Minnesota, BBS data reveal a nonsignificant decline of 0.62% per year from 1967 to 2015 (Figure 6). By contrast, more recent NFB data in Minnesota’s two national forests reveal that Cedar Waxwing populations have experienced a significant increase from 1995 through 2016, with a combined regional increase of 2.81% per year (Figure 7). Range-wide, the Cedar Waxwing is increasing across much of the southern portion of its breeding range and is decreasing-to-stable in its northern regions. It also is decreasing throughout the Appalachian Mountain region, which stretches south to northern Georgia (Figure 8). Unfortunately, no detailed studies examine factors responsible for local population fluctuations. By and large, fluctuations are thought to reflect changes in food resources that are a consequence of changes in land use. The species’ increasing abundance in some areas may reflect the succession of farmlands to young forests, which provide the ideal open woodlands favored by the species. The addition of agricultural fruit crops in some regions, coupled with ornamental fruit tree plantings in residential areas, also benefit the Cedar Waxwing. As a frugivore, the cessation of DDT to control insect infestations on fruit crops and ornamental plants also may have contributed to population increases in some regions (Witmer et al. 2014). Factors responsible for local declines are less clear but are likely related to broadscale habitat changes that impact the availability of open woodlands and berry crops. 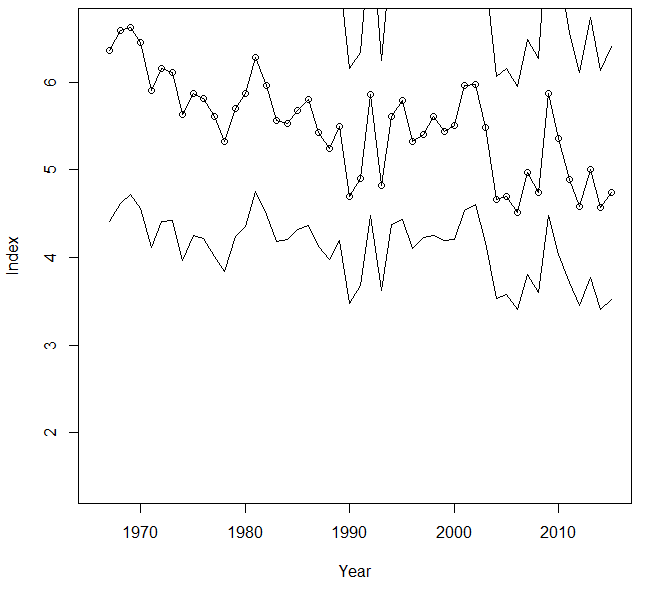 Breeding population trend for the Cedar Waxwing in Minnesota for 1967–2015 based on the federal Breeding Bird Survey (Sauer et al 2017). Breeding population trends of the Cedar Waxwing in the Chippewa and Superior National Forests and the combined regional trend, 1995–2016 (Bednar et al. 2016). Population Trend Map for the Cedar Waxwing for 1966–2015 based on the federal Breeding Bird Survey (Sauer et al. 2017). Although population trends vary, overall the Cedar Waxwing’s relatively stable and large population, coupled with its wide distribution, has made it a low conservation priority at the state and the federal level. It was assigned a low Continental Concern Score of 7/20 by Partners in Flight (Rosenberg et al. 2016). In some local situations, the species is considered an agricultural pest that damages fruit crops (Witmer et al. 2014). Predictions regarding the Cedar Waxwing’s vulnerability to climate change vary. Matthews and his colleagues employed two models that predicted a significant decrease in population size and distribution across the eastern United States (Matthews et al. 2004). More recently, a cursory assessment by the North American Bird Conservation Initiative assessed the species’ vulnerability as low (North American Bird Conservation Initiative 2010). In the short term, the Cedar Waxwing’s abundance and distribution across Minnesota, aided by its general habitat requirements and adaptability to human-modified landscapes, ensure that this handsome bird will likely remain a common member of the state’s avifauna. Ehrlich, Paul R., David S. Dobkin, and Darryl Wheye. 1988. The Birder’s Handbook. A Field Guide to the Natural History of North American Birds. New York: Simon & Schuster, Inc.
Rothstein, Stephen I. 1971. “High Nest Density and Non-Random Nest Placement in the Cedar Waxwing.” Condor 73: 483–485. Saunders, Aretas A. 1911. “A Study of the Nesting of the Cedar Waxwing.” Auk 28: 323–329.